BAS supports phone verification through one of following services: http://smspva.com, http://sms-reg.com and http://sms-activate.ru. If number is banned, use “Number already in use” action. 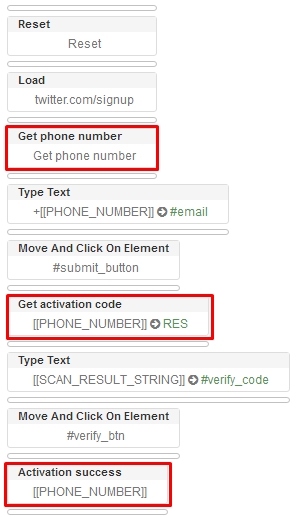 Use action “Get activation code” to obtain verification code. Submit activation code on site. If activatnion was success, use “Activation success”, or “Activation fail” otherwise. You can optionally request another activation code with “Get activation code” action in case if site allows to use number for several accounts. Call “Finish using number” if you don't need it anymore. Optionally you can call “Enable debug” action to see which API requests BAS does. All activation services use same interface and same actions, so you let script users deside, which service they want to use and don't change your script! Here is minimal example - phone activation for twitter.